GC-TOFMS Application: Fluorocarbon polymers analysis by TG-MS ーHigh m/z range measurement using TG-TOFMS systemー | Applications | JEOL Ltd.
Thermogravimetry (TG) is a thermal analysis technique that measures sample weight changes during sample heating and provides sample thermophysical properties. Combining a TG with a mass spectrometer (MS) makes it possible to perform the qualitative analysis of organic compounds that are evolved as the sample weight changes. Typically, a general purpose quadrupole MS is used for these types of analyses. However, since the measurable m/z range limitation of a quadrupole MS is about m/z 1,000, this detector provides limited capabilities for the analysis of synthetic polymers and high molecular weight compounds. Alternatively, a time-of-flight mass spectrometer (TOFMS) can be used in combination with the TG to provide a wider measurable m/z range (greater than m/z 6000). 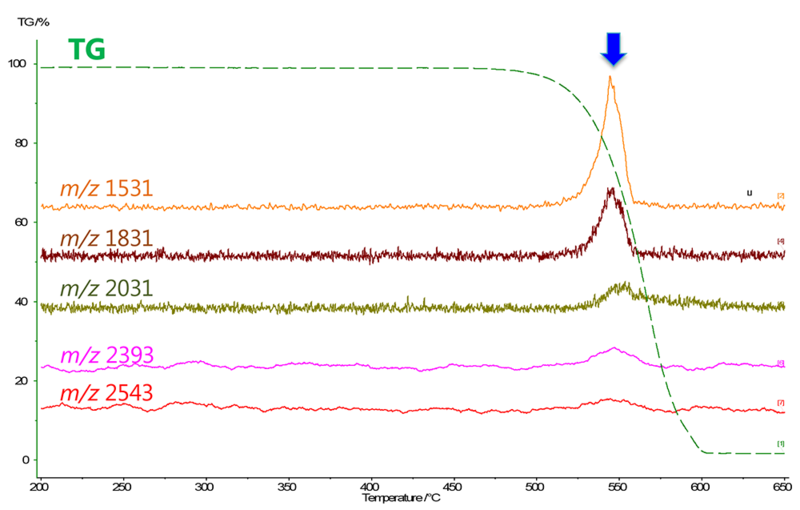 In this work, we measured a fluorocarbon polymer by using a TG-TOFMS system. 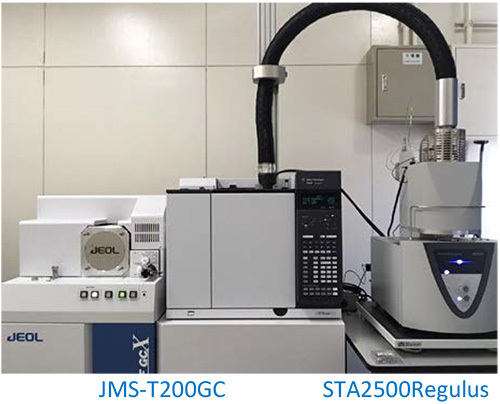 The fluorocarbon polymer was analyzed by using a JMS-T200GC "AccuTOF™ GC" (JEOL Ltd.), gas chromatograph / high-resolution time-of-flight mass spectrometer equipped with a STA2500 TG system (NETZSCH Co., Ltd.) as shown in Fig. 1. The measurement conditions are shown in Table 1. The GC was used as a thermostatic oven with a fixed temperature of 350 °C with blank capillary tube (3m X 0.25mm I.D.). The TG-TOFMS measurement result for 5 mg of fluorocarbon polymer is shown in Fig. 2. The TG curve showed that the weight reduction started around 500 °C and stopped at 600 °C. An EI mass spectrum around 550 °C is shown in Fig. 3. A number of high mass ions with specific repeat units were observed around m/z 2,500 that were indicative of the fluorocarbon polymer thermal decomposition. 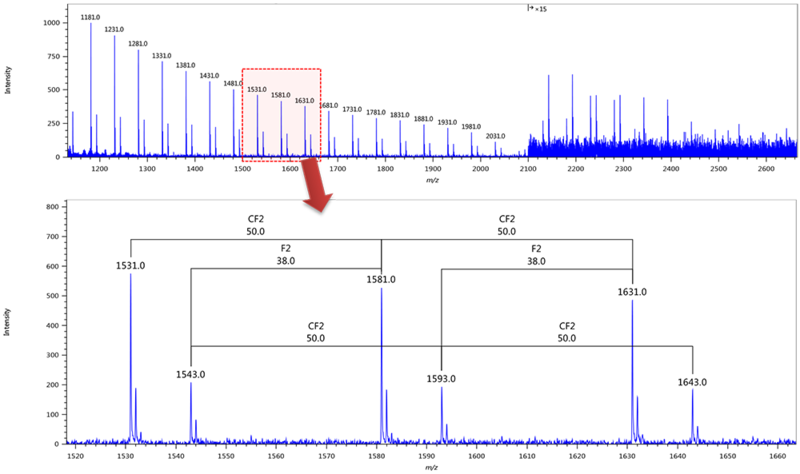 The m/z 1,531; 1,831; 2,031; 2,393 and 2,543 EIC chromatograms are also shown in Fig. 2. The maximum for each EIC chromatographic peak was consistent with the weight reduction indicated by the TG curve. This data shows that the thermal decomposition reaction for the fluorocarbon polymer occurred between 500 °C and 600 °C, as detected by the TOFMS. An enlarged EI mass spectrum around m/z 1,600 is shown in the lower part of Fig. 3. Ions were observed at repeating units of CF2 (50 Da), and another minor series corresponding to mass difference of F2 (38 Da) was also observed with the main series peaks. The TG-TOFMS data showed that the measurable m/z range greater than 1000Da which is wider than ordinary TG-QMS and can be used for the measurement of synthetic polymers in the oligomer region.